This is the next installment of the best-selling fantasy series, the "Deverry Cycle", long-awaited by Katharine's many fans. The powerful dweomermaster Nevyn has been reincarnated, but young Neb knows nothing of his previous life. Orphaned following a cholera epidemic, Neb and his younger brother arrive at the desolate farm of their last living relative and soon learn that a worse plague lurks beyond the western border of Deverry. The savage Horsekin tribes, spurred on by their new goddess, Alshandra, are raiding the villages and taking slaves as the first step in their plans to destroy both the nomadic Westfolk and the Deverrian farmers. Neb finds love and danger as he and his soulmate Branna are drawn inexorably into a war for the survival of the kingdom itself. Although they have powerful allies in the Westfolk dweomermasters Dallandra and Salamander, they are also facing mighty enemies, enemies that they have fought before in the past lives that they no longer remember! 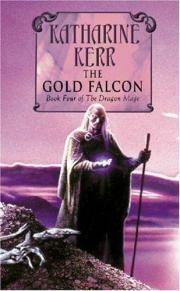 Intricately interweaving human and elvish history over several hundred years, Katharine Kerr's enthralling and moving tale of extraordinary characters living their many lives through exceptional times is epic fantasy on truly a grand scale.